[SOLVED] Washing Machine Using Cold Water When Set To Hot - How to Fix? [SOLVED] Washing Machine Using Cold Water When Set To Hot – How to Fix? We have provided here the solution for Washing Machine Using Cold Water When Set To Hot. You notice that your Washer Not Filling With Hot Water. You have experimented with all the heating setting, like trying with hot wash and warm wash but still you get washer does not fill with hot water. Now now need to worry as we have given the solution below for Washing Machine Using Cold Water When Set To Hot. Have you moved you washer some further away from the hot water heater, like moving the washing machine from home to your garage then due to the distance involved, it may take approximately nearly 2 minutes for hot water to reach the washing machine. So try running the hot water from any sink faucet or tap which is nearer to the washing machine for hot water. And see if its coming, after this check the washer to see if hot water is coming or not. If you are still facing Washing Machine Using Cold Water When Set To Hot then please read below. Please note that before you try any troubleshooting, make sure that you switch off the washing machine and make sure to not remove any water hoses before you switch off the water valves. Make sure that the hot water heater is working and the other faucets are providing the hot water. If it is not getting hot water then check the water heater or the faucet. Please check the hot water valve and confirm that it is open. This Hot water valve if closed will not supply the hot water to washing machine. You can find this valve at the back of the washing machine. Also please make sure that hot water hose is not blocked or clogged. A clogged hot water hose will stop hot water getting into the washer. Also check the hose mesh filter for any blockage or check if it is clogged. Mesh filter is the part which connect hose with the washing machine. Please remove the rear panel of washing machine and check carefully the wiring coming and going from water valve. Tighten any loose wires and remove and replace any damaged wiring or wiring harness. Check the water valve carefully for any blockage. 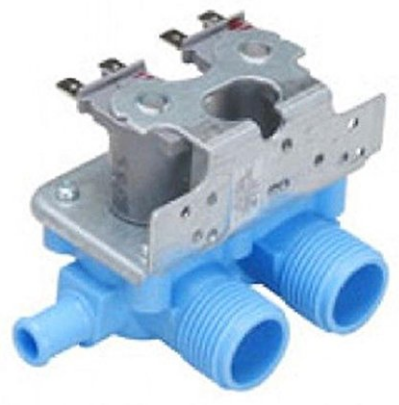 Also check for any fault at hot water solenoid. A fault will stop hot water from entering into the washer and so water valve needs to be replaced. Please check the heater timer mechanism and please make sure that it is not loose or there are no damaged wire in it. Check the all Washers Water Valve below from Amazon. We hope that now you are able to troubleshoot and solve Washing Machine Using Cold Water When Set To Hot. You can check other issue like washer leaking from bottom etc in our site. Please do comment for your questions.